Whenever I see screenshots of Final Fantasy Crystal Chronicles on the DS I tear up a bit (well, not really) thinking about how great Square games could have been on the N64. Sigh. Anyway, the N64 is long since dead, so there's no use in thinking about that too much. And, now we have the nifty lil' machine known as the DS that not only has better graphics than the N64, but throws many other interesting things into the mix as well. 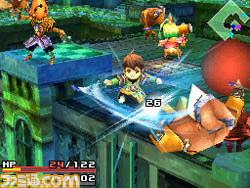 Some of those "things" are sure to come into play in Final Fantasy Crystal Chronicles. Updates have been few and far between for this title as of late, but with the short gameplay clip that Square posted to its site last week and now these scans that have appeared on Famitsu's website, maybe we're finally seeing the floodgates fly open? Let's hope so.